BEST QUALITY FOR YOUR CHILD: Tiny Land's teepee tents are made of 100% natural, non-toxic, unpainted cotton canvas. The tent poles are made of sturdy pine wood and are free of chemical odors and harmful substances. 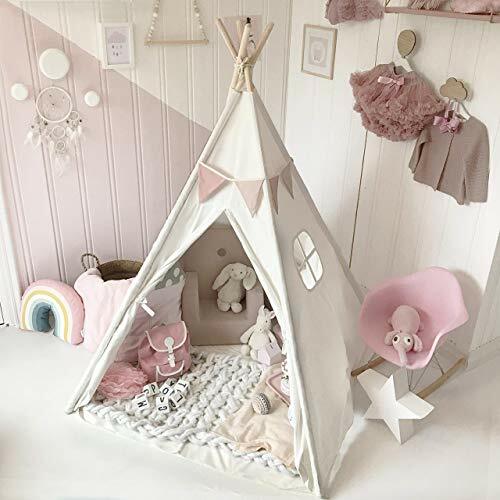 Only the best for your little boy or girl!.PERFECT INDOOR & OURDOOR PLAYHOUSE: These teepee tents make for the perfect space for kids to play and relax in. They can be setup either at home or outside and provide children with a feeling of privacy and personal space, while allowing parents to monitor them for their safety..PORTABLE & FOLDABLE: Tiny Land's play tents are lightweight and easy to set up. Likewise, they are ease to disassemble and fold and they come with a carry bag to put them in. These cotton canvas playhouses are made to be portable and practical, so that you can carry your child's favorite teepee anywhere with you!.GREAT CHILDREN'S GIFT IDEA: Whether you have a little Indian of your own, or looking for a nice present for the child of a friend or family member, this canvas teepee tent is a great gift. It also comes with bonus cheerful decorations - a colorful bunting!.100% RISK FREE PURCHASE: We at Tiny Land love our teepees. We use them themselves, too - or at least, our kids do! In the off-chance you are not satisfied with your cotton canvas playhouse, we'll make sure we do everything in our power to assist you!